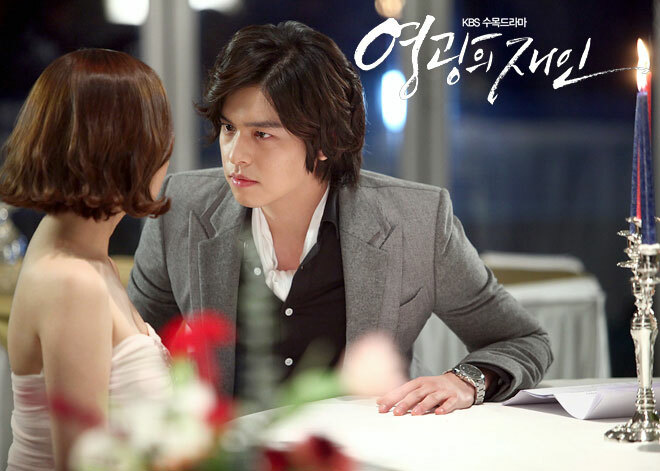 In the episode 19 of Glory Jane (Man of Honor) broadcast on December 14th, 2011, the courageous kiss scene of Park Min Young and Lee Jang Woo in public eyes has attracted the attention of viewers. Seo In Woo who has been unrequited loving Yoon Jae In, is kissing her with full sincerity, and the expectation of viewers to their relationship has heated up. Especially for Seo In Woo as the son of Seo Jae Myung who destroyed the life of Yoon Jae In, the kiss scene between the two persons is meaningful. In this dangerous time when the face-to-face battle between Seo Jae Myung and Yoon Jae In about to start, the kiss of Seo In Woo to Yoon Jae In is no different from declaration of war against Seo Jae Myung. The kiss scene was shot in a hotel in Seoul on December 12th, 2011. Park Min Young and Lee Jang Woo were wearing the one-piece dress and suit that matched the atmosphere of the dinner party respectively to appear, instantly heated up the atmosphere on the filming set. The appearance of the two persons kissing in the atmosphere on the set laden with grief yet revealed trace of sweetness, really completed an extremely poignant and romantic picture. Especially Park Min Young and Lee Jang Woo had filming overnight till morning previously, deeply involved in the tight shooting schedule, but never revealed sign of tiredness, and insisted on continue filming, which had made the staff crews amazed. When the direct shouted “action,” they quickly immersed into the mood of the characters they acted, as such the scene was successfully shot just one time without the need of too much NG, showing the professional side of them. During the gap in shooting, they took photos themselves, or chit chatted and played jokes, the harmonious atmosphere also helped them to complete the shooting smoothly. In addition, in the 18th episode of Glory Jane, the rating of 18.3% during the scene where Yoon Jae In furiously slapped Seo Jae Myung in the face has become the highest-rated scene for the drama. In the episode 19, Yoon Jae In and Seo Jae Myung will engage in sharp confrontation, and whether big chaebol played by Byeon Hui Bong will become reinforcement to help Kim Young Kwang is making viewers looking forward to it.